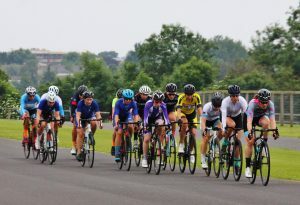 Nathan Hallett (Latchem Sunwise) and Lucy Driver (Forever Pedalling) have established themselves as the dominant sprinters in the Odd Down Summer Series, and with multiple bunch sprints in recent rounds there have been plenty of opportunities for the fast finishers. However, the pair have carried that form to take advantage of earlier escapes to secure an impressive pair of victories in Round Six last week. The returning India Lee defined the tactical approach of the women’s E/1/2/3 race on Thursday, with both Charlotte Berry (VeloVitesse) and Driver gluing themselves to the favourite’s rear wheel. This gave Lee little room to manoeuvre with and when her second attack of the race got some clear air to the bunch, it was Berry and Driver who were in place to capitalise and form the breakaway. This left second overall Lauren Johnston and her Avid Sport teammates in a position where they would have to do the chasing in the main group and at first the gap was not growing rapidly, helped by a wariness in the front three of a counter-attack. However, despite this lack of cohesion, as the race wore on it was clear that the bunch were running out of ideas and the break would not be brought back. It was in this moment the Lee threw down the gauntlet again, with series leader Berry unable to hold the pace up front. Johnston took her prompt to bridge the gap to bring the fight for the overall series lead down to a two-up sprint behind the front pair. The question was whether Lee could find a way to dispatch Driver in the same way as she had done to Berry, with her companion offering little assistance in driving the pace now that their margin over the rest of the race was clear. Despite Lee’s best efforts, Driver never looked in difficulty and so the finish was a first defeat for Lee at Odd Down this year and a huge scalp for Driver who re-asserted her overall series ambitions. Berry made sure that she forced Johnston to lead the sprint for third out, and used this to get the better of the rider who has pipped her to the line twice already in the series. A returning Laura Rayner (Westbury Wheelers) took the bunch kick behind for 5th. In the women’s 4th cat race, Laura Wells (Mickey Cranks CC) continued her run of top-two finishes with second behind newcomer Nicole Coates (Performance Cycles). Coates had been looking strong throughout the race and had seemed to be prising the group apart with her attacks as the race passed the halfway point. However, Wells and third-placed Sally Crocker (Salt and Sham CC) held strong along with series first-timer Emily Harford to ensure Coates would have to win the race in a sprint. The results see Berry extend her lead over Johnston at the top of the standings to twenty points at the halfway stage and brings Driver back into contention, only five points behind Johnston. Lee is also back in the top five with Wells not far behind in seventh. 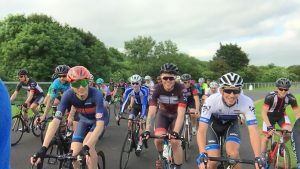 The men’s series looked to be lined up as a shootout between some of the area’s biggest racing teams, but even with six rounds to go in the series, one team has emerged to dominate the racing over the first part of the series; Latchem Sunwise – led by one rider in particular: Nathan Hallett. He made it three wins in a row on Tuesday having had the help of his teammates to lock the race in two separate breakaways of three riders. Having escaped early alongside Rob Hardyman (Forever Pedalling) and Sam Lindsay, Hallett was able to capitalise on a moment’s hesitation by the bunch to re-escape almost as soon as he was recaptured in the final 10 minutes of the race. Lindsay was also able to persist in front, whilst Hardyman was replaced in the move by Jared Linden (Royal Dean Forest CC). The initial move had barely been given any lead by the peloton, but this time the chase did not materialise and the gap quickly grew out to an unassailable advantage. This meant that with two laps to go the new leading trio were out of sight of the pursuers, and able to fight out the podium amongst themselves. Despite Linden having spent the least time out front, Hallett still had enough to jump past him and Lindsay was left to hang on for third. In the men’s 3,4 race, it was a series of late moves from Bristol RC that posed the biggest threat to the sprinters. However, the bunch would not be denied and it was Bikestrong-KTM’s Rob Abraham who managed to build on very strong rides over the past few rounds to take win, narrowly edging out James Dudden (Latchem-Sunwise) and Daniel Carr (Salt and Sham CC) with a late surge on the left hand side of the finish straight. Hallett’s win builds his overall lead out to 65 points ahead of James Phillips (Bristol RC) who has missed the last two round with injury. Phillips’ teammate Tom Sharp is in third place, a further 32 points behind.